The owners of 2010 Westmere Mac Pros are likely envious of the 2011 MacBook Pros and iMacs with Thunderbolt. It's not clear if and how Thunderbolt will be implemented on the rumored 2011 Mac Pro. In the meantime, HighPoint Technology has an alternative storage solution. 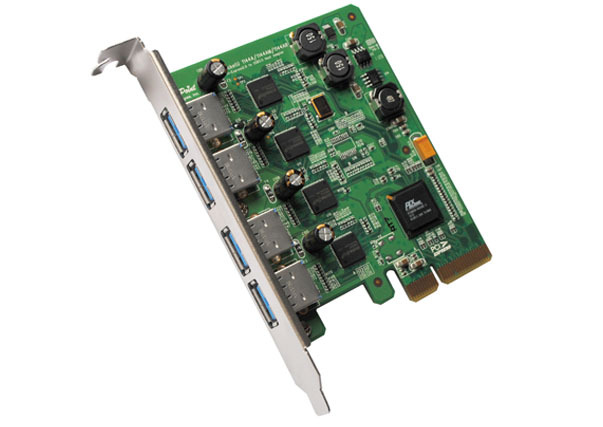 It's a four lane, four port USB 3.0 RAID enabled host adapter called the "RocketU Quad." It comes with a RAID Manager that supports RAID 0, 1, 5, 10, and JBOD. It supports hot-swap, too. We ran it through some tests using RAID 0 mode with four 7K HDDs and four 6Gb/s SSDs. We used the Disk Read/Write test with 4GB file size, 2048x1556 10-bit RGB Video Frame Size, and File System Cache Disabled. Graph shows the average for 335 frames. Longest bar (RED) means FASTEST. We timed how long it took to duplicate a 6.45G folder with 146 items of various sizes. Then we converted the results to megabytes per second. Longest bar (RED) means FASTEST. 6Gssd*4 Tbolt = Four OWC Mercury Extreme 6G SSDs inside the Promise Pegasus R4 Thunderbolt enclosure. The Promise RAID utility was used to set up the RAID 0 set. The enclosure was connected to the 2011 iMac Core i7's Thunderbolt port. 6Gssd*4 RockU = Four OWC Mercury Extreme 6G SSDs plugged into four Voyager S3 USB 3.0 drive docks connected to the RocketU Quad. "Hard" refers to the fact that we used the RocketU's RAID manager to create the RAID 0 set. HDD*4 Tbolt = Four Hitachi Deskstar 7K3000s (2TB) inside the Promise Pegasus R4 Thunderbolt enclosure. The Promise RAID utility was used to set up the RAID 0 set. The enclosure was connected to the 2011 iMac Core i7's Thunderbolt port. HDD*4 RockU = Four Hitachi Deskstar 7K3000s (2TB) plugged into four Voyager S3 USB 3.0 drive docks connected to the RocketU Quad. "Hard" refers to the fact that we used the RocketU's RAID manager to create the RAID 0 set. The RocketU Quad was installed in slot 3 of the 2010 Mac Pro 6-core Westmere. When you think high performance RAID, you don't think USB. Therefore, HighPoint has achieved a significant milestone to offer a USB 3.0 RAID capable host adapter that can compete with other storage technologies in features and performance. Though the HighPoint RocketU Quad USB 3.0 RAID adapter didn't attain the published 20Gb/s theoretical transfer rate, it was close to Thunderbolt in real world transfer speeds. For Mac Pro owners, it's an alternative storage solution worth consideration. For this article, we simulated a four bay, four port enclosure by using four individual Voyager S3 USB 3.0 drive docks. What would make the RocketU an even more compelling alternative storage solution would be if some company would produce a four bay, four port USB 3.0 enclosure. All existing multi-bay USB 3.0 enclosures use a single port to connect to all drives installed, thereby limited the speed to under 200MB/s. Neither the RocketU/Voyager combo nor the Pegasus Thunderbolt enclosure taps the full potential of the 6Gb/s SSDs. If you are using 6Gb/s SSDs and want to squeeze out their full speed potential, I recommend a SATA/SAS RAID adapter like the HighPoint RocketRAID 2722 which measured 1500MB/s with four 6Gb/s SSDs in a previous test.